Blackfoot was born in Cleveland, Ohio, on May 9, 1944, but spent most of his early years in Columbus until age 8 when his father got an office job with the Atomic Energy Commission and moved his family to Oak Ridge, Tennessee. Oak Ridge was a very secret place in those days. After graduating from high school, he joined the Maryland National Guard, but since he was again spending most of his time in Bladensburg, where he had few friends, he became something of a loner. Then, one Saturday, he was walking past a music store and saw a $78 Kay guitar and amplifier in the window and bought the package. He also purchased a chord chart. Immediately, he took his treasures home, learned three chords and wrote two songs before the weekend was over. After he had mastered the Kay guitar enough to play tunes, Blackfoot and a buddy found a third player and formed a trio called the Starfires. The trio played one gig and broke up because the drummer moved to California. Music then became a private thing for the young man. He didn’t share it with anyone, didn’t attempt to join another group, just kept on truckin’ for the next couple of years with no particular direction in mind. In 1965, his father died of a cerebral hemorrhage while on a business trip to Charleston, South Carolina, and Blackfoot’s mother moved back to Columbus, which is where his father was buried. A short time later, the 21-year-old, who had no real ties in Maryland, headed for Columbus, too. Since there were no openings in the Ohio National Guard at the time, he transferred to the Air Force Reserve and served with an air police unit in Wilmington, Ohio, from 1966 until 1970. So, in 1967, when Blackfoot was already 23 years old and had never performed in public except for that single gig with the Starfires, he learned that a local band called the Ebb Tides was looking for a singer/rhythm guitar player. The group was scheduled to do an 18-state summer tour of the county fair circuit. In 1970’s “The Ultimate Prophecy,” which now demands top dollar if you can find a copy, was done in two takes over a single weekend at Mercury Recording in New York. His second album "The Song of Crazy Horse" was recorded in New Zealand in 1973 and won New Zealand’s R.A.T.A. (Recorded Arts Talent Award) Album Of The Year award for 1974. The title track is a 20 minute saga about the life of the Oglala Sioux Chief Crazy Horse. It was released in 24 countries on the Fantasy label and to this day is still captivating new listeners around the world. The album received spotlight picks in Billboard, Cashbox, and Record World magazines. History and English teachers often use The Song of Crazy Horse in their classroom when teaching about the American west and Native American history. Wherever radio stations were willing to play a 20 minute track, The Song of Crazy Horse instantly made the phone lines light up. In St. Louis, MO, KSHE FM has played The Song of Crazy Horse on its Sunday classics show for 38 years. 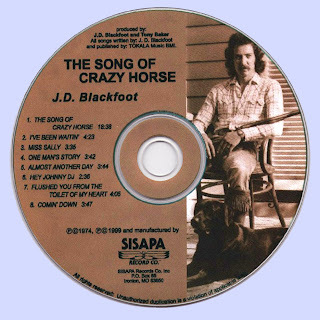 All songs by J. D. Blackfoot except where noted. His real name was Benjamin Franklin VanDervort, but in 1970, he legally changed his name to J.D. Blackfoot. He has always owned the name "J.D. Blackfoot". J.D. 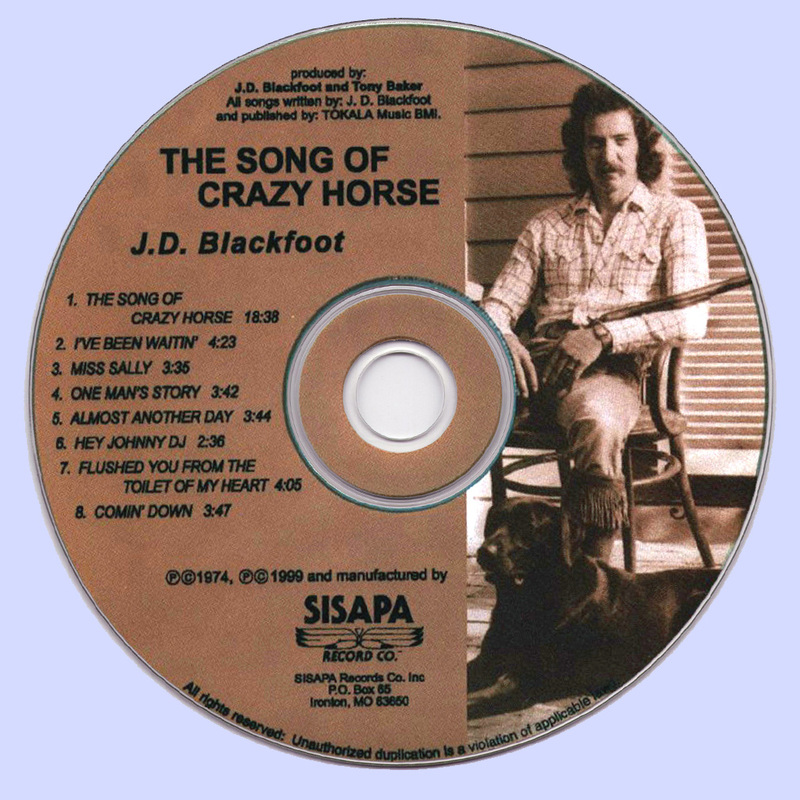 Blackfoot is not a Native American Indian although he has released two albums which dealt with this topic. He has also held various benefits for the American Indian. A dream in 1968 motivated him to change his name. According to J.D. - "One night in 1968, I dreamed that I was sitting on a pinto horse on a very steep hillside under a pine tree. I could feel the pine branches sticking me in the neck while, down below me, Custer was getting wiped out." This dream not only motivated him to change his name, but also was the inspiration for "The Song of Crazy Horse." The opening lines to "The Song of Crazy Horse" were written in 1968. J.D. Blackfoot had a dream where he was watching a battle between Custer and a tribe of Indians. After awakening early in the morning, he wrote the introduction to the song. He finished writing the remainder of the song three years later in 1971. This same dream also inspired him to legally change his name to J.D. Blackfoot in 1970. After recording and releasing "The Ultimate Prophecy", he experienced some problems with his record company and he decided to take a break from recording for awhile. His wife was a native of New Zealand and suggested they go there. While there, J.D. assembled a band and recorded "The Song of Crazy Horse". This album won the New Zealand Album of the Year Award for 1974. The original vinyl version of "The Song of Crazy Horse" contained two songs on Side 1 - "The Song of Crazy Horse" and "Ride Away". The CD version contains both of these songs with no pause between them and the song "Ride Away" is not listed separately. Why the difference? "The Song of Crazy Horse" was originally recorded and intended to be one long song of approximately 18 minutes and 45 seconds in length. However, when the album was released on vinyl, the record company, Fantasy, inserted a pause at approximately 14 minutes and 30 seconds into the song. The remainder of the song, approximately 4 minutes in length, was then labeled as "Ride Away". The intent of the record company was to create a shorter song which would receive more airplay and possibly be released as a single. However, the song "Ride Away" was not released as a single. When J.D. 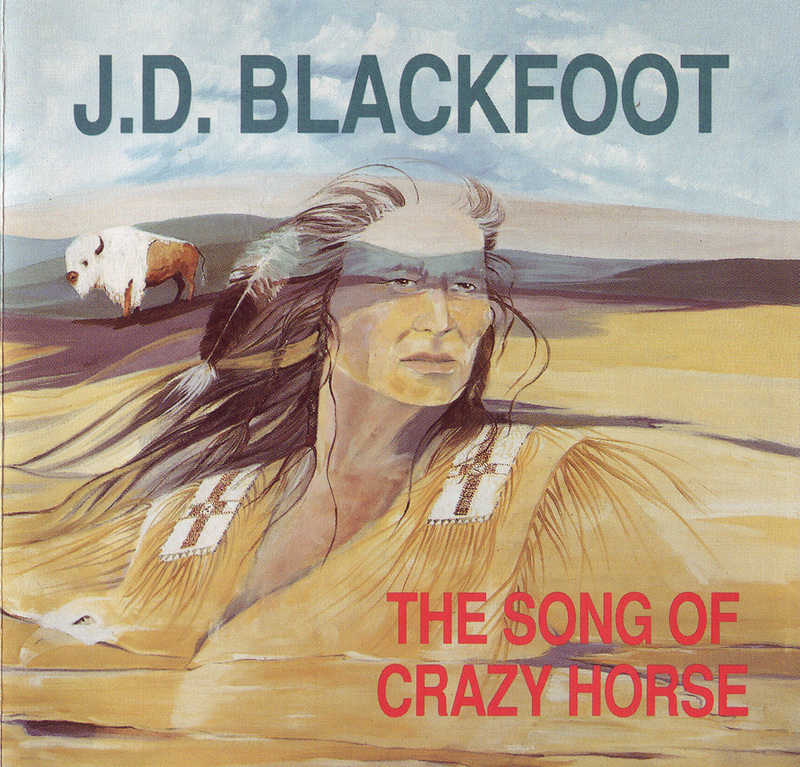 Blackfoot re-released "The Song of Crazy Horse" on compact disk, he restored the song to its original version and length,is a tribute to Chief Crazy Horse and his tribe.